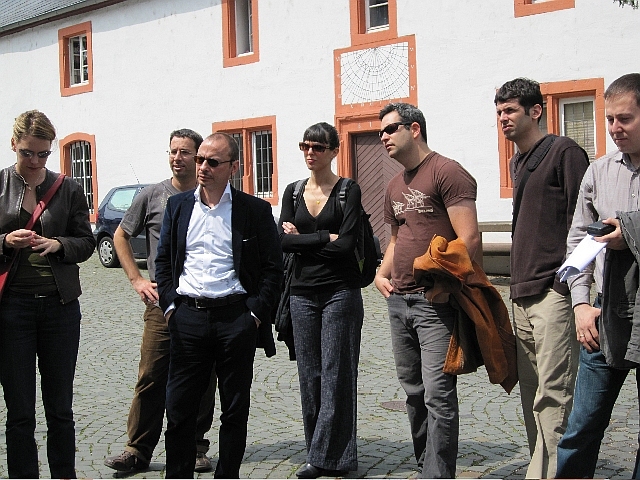 The second Leo Baeck Fellows workshop, held in Kleinich in the country house «Arnoth» (30 May – 2 June 2010), was characterized by the diversity not only of the research topics, but of the extra-curricular activities and evening discussions. After having presented one global aspect of our work in the first workshop in Brighton, in Kleinich we discussed a more specific aspect of our work. The workshop opened with Dr. Daniel Wildmann’s evening debate about the «case» Wilkomirski, based on his own documentary film about the autobiography of a fake Holocaust survivor. Although our thirteen research topics were very diverse, this evening provoked intense debate about Shoah writing, philosemitism, memorialisation. During the first morning of the workshop we discussed four very different topics which were linked to the history of rural Jews, German Jewish political history and contemporary Jewish life in Berlin. The afternoon visit of the Laufersweiler synagogue was followed in the evening by Dr. Cathy Gelbin’s fascinating presentation of her forthcoming book, The Golem Returns. From German Romantic Literature to Global Jewish Culture, 1808–2008. The second morning was dedicated to the work of the psychoanalyst Paula Heimann and the philosopher and historian Gershom Scholem and concluded with discussions about Joseph Roth’s novel Hiob. After our visit of the Cusanus seminary and a walk in the small town of Bernkastel-Cues, our day ended with a fruitful discussion about our future after the PhD, punctuated among others by Prof. Raphael Gross’ precious advice. The last day of our workshop concluded with a series of presentations as diverse as Jewish education in interwar Vienna, the elderly in Theresienstadt, acculturation in the work of 18th century author Baruch Lindau, Jewish and Japanese intellectuals on Pan-Asianism and Jewish Folkloristic. This last workshop not only helped us individually in developing our research, but paved the way for a common reflection beyond the specificities of our own work.